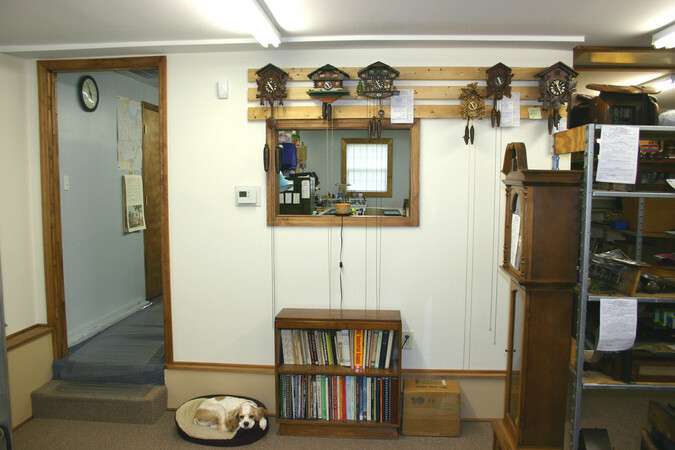 Amazingly enough every clock shown on the wall behind the counter has been sold! 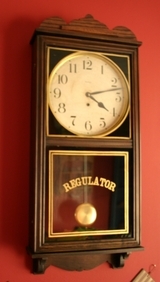 New clock display showing clocks currently available as of August 2013. 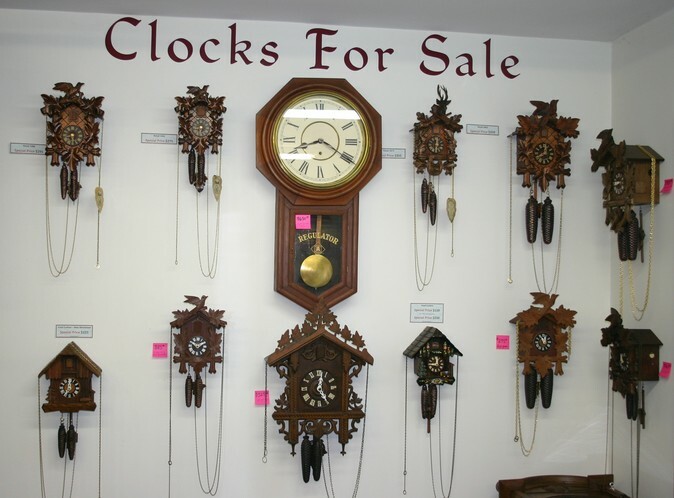 To see individual clocks for sale with prices and descriptions please click on the link below. 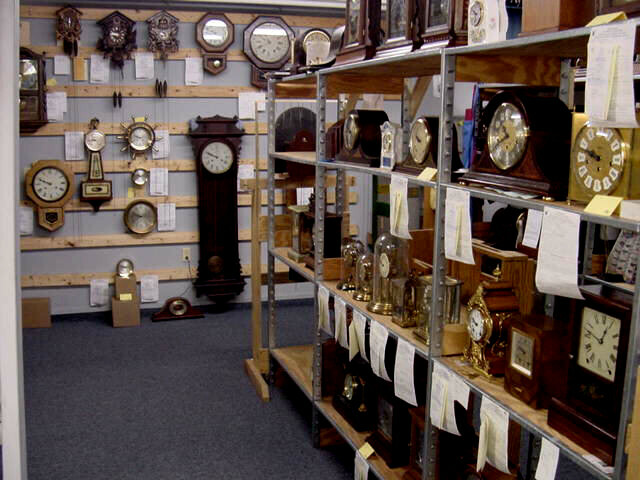 About half of these clocks have already been sold as of February of 2014. 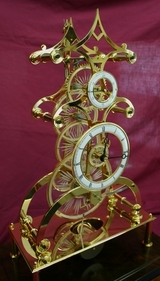 Click on link below for complete listing of current clocks for sale. 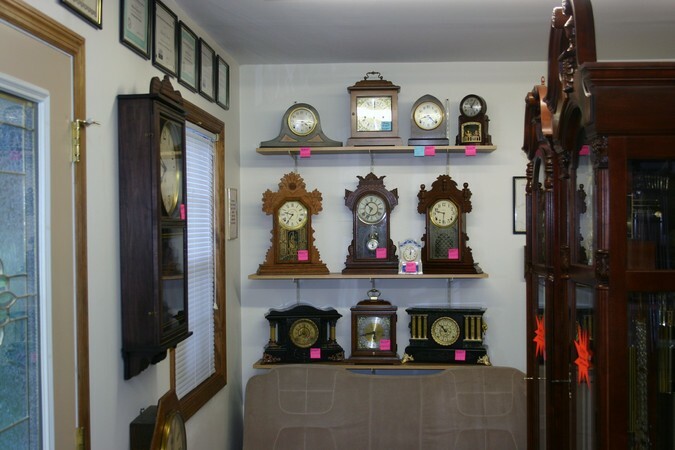 Area showing selection of used grandfather clocks for sale. 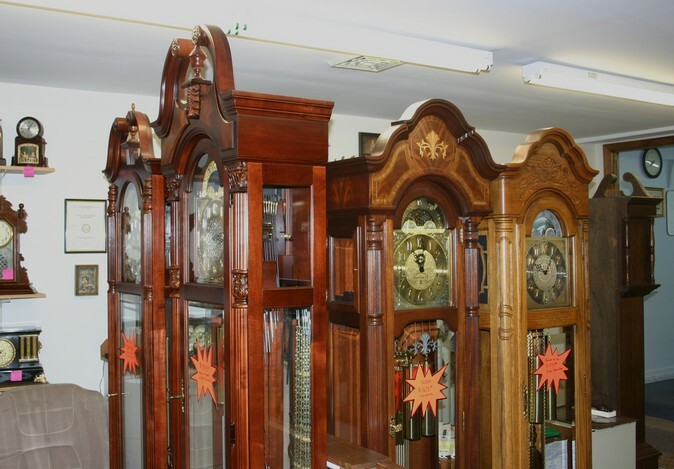 As of February 2014 we have 6 used floor clocks from $595-$1950. Two of the ones shown here have already been sold. Click on link below for complete descriptions and prices. Testing area on left, office on right, customer area in background near front door. That good looking dog is Lady Guinivere. Unfortunately she is no longer with us although her picture hangs in the shop as a remembrance. resting in her bed waiting to greet the next customer. Parts bins on shelves and small part cabinets on counter top on left side of photo. Old wooden library card catalogue shown on right full of tools and parts. Also drill press on right. Window above my bench looks into testing area. 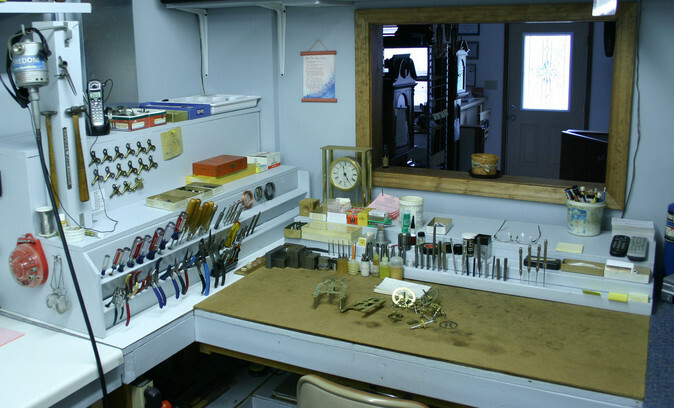 This view shows additional work area. You can never have too much counter space. This is very helpful when you have two or three jobs going at once. 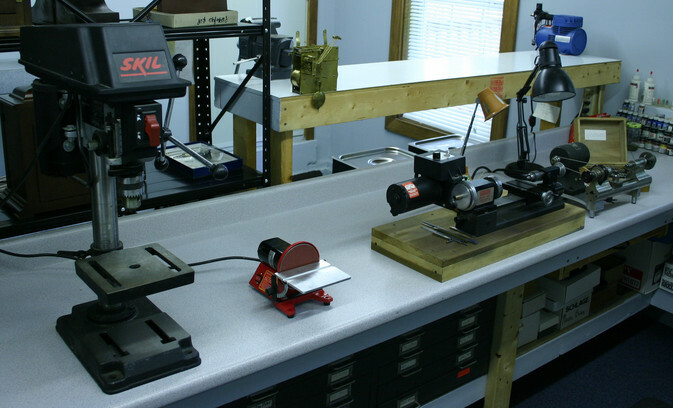 Drill press, disc sander and two lathes. More parts cabinets under counter top. 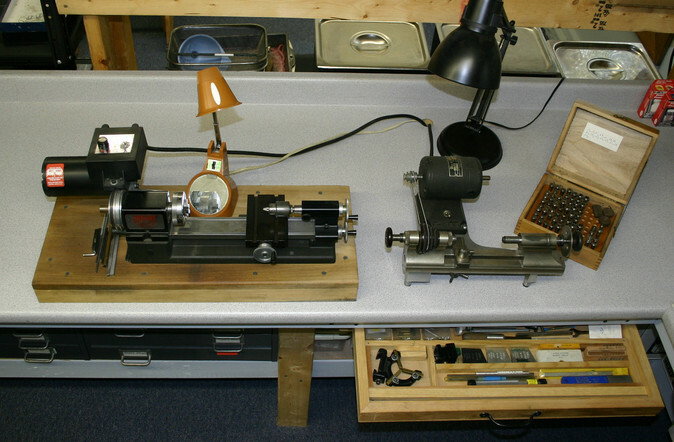 On the left is my Sherline lathe and the right is an old watchmakers lathe with open box of collets. 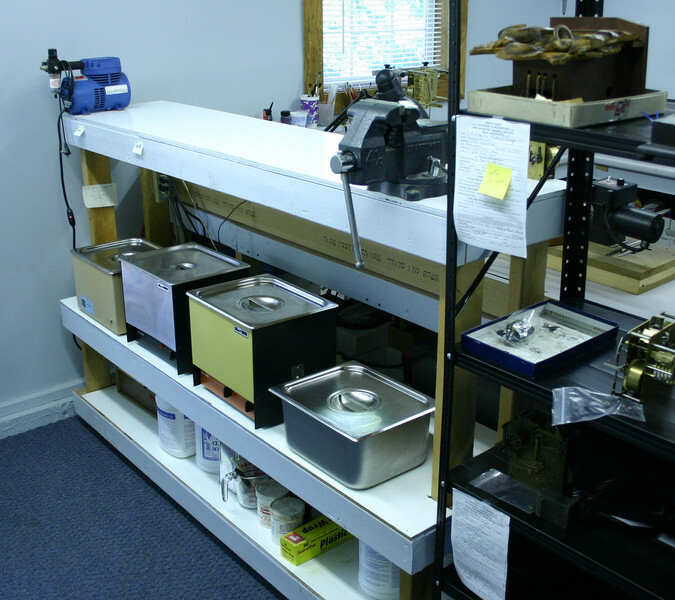 Open drawer shows lathe accessories. My four ultrasonic cleaners. 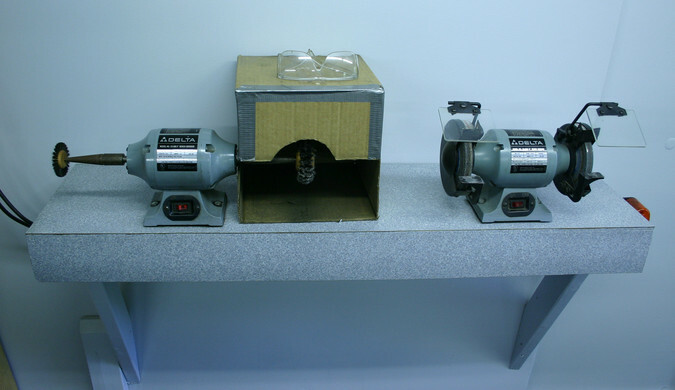 Ultrasonics is a method of cleaning which uses a chemical degreaser combined with a process called cavitation. Cavitation is the implosion of millions of microscopic bubbles within the cleaning fluid creating a “scrubbing” action. These small bubbles are able to reach into very small places. For those few movements that do not require disassembly before cleaning, ultrasonics is the most effective method. 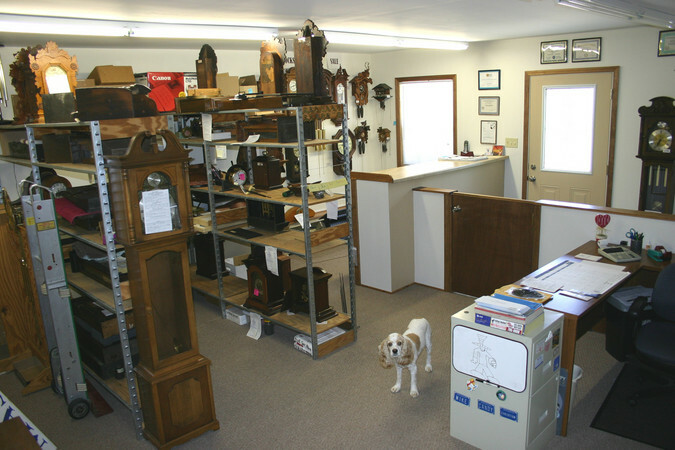 This is where clocks are tested after repair. 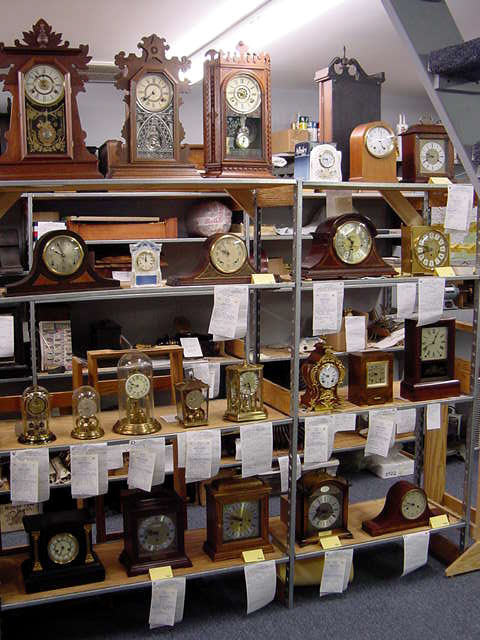 Most clocks are run for a minimum of one week to assure proper operation before releasing to the customer. 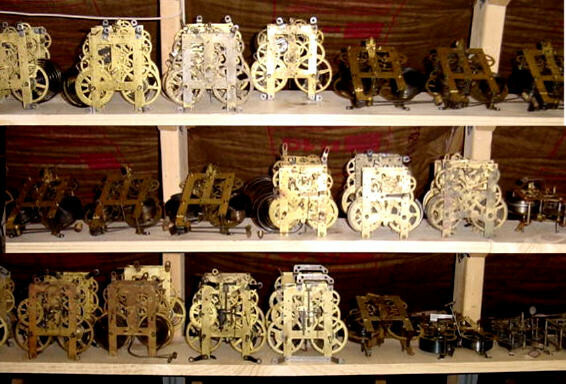 I have an inventory of antique clock movements and parts. If I do not have what you need I can probably get it elsewhere.